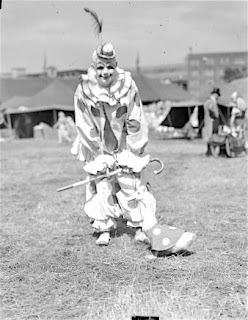 Felix Adler was the consummate American three-ring circus clown in the first half of the 20th century, an asset to the Alley in the ring, on the track and as a "picture clown", as these photos show. 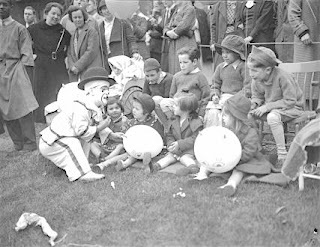 Felix was also instrumental in schooling many young clowns in the classic Ringling/Barnum style. He wasn't called "The King" for nothing! There are 20 horses waiting to make their entrance on back track of this huge arena but I bet your eye gravitates towards the tiny figure with the perfect posture making her exit in the dark on front track. That's Dolly at the Tarzan Zerbini Detroit Shrine date. A very happy birthday to you both and many, many happy returns. More of Charlie Rivel's masterful entree. 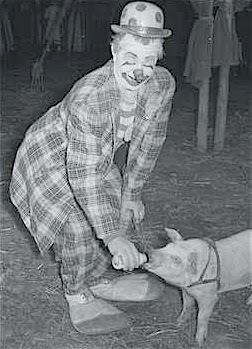 One of the 20th century's truly great clowns, the brilliant Charlie Rivel. 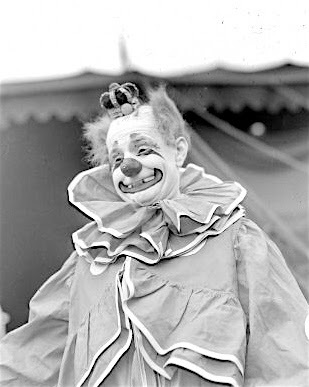 Ladies and Gentlemen, the polls are now open and votes are being taken for the 1st annual Felix B. Adler Awards for American Circus Clowning. 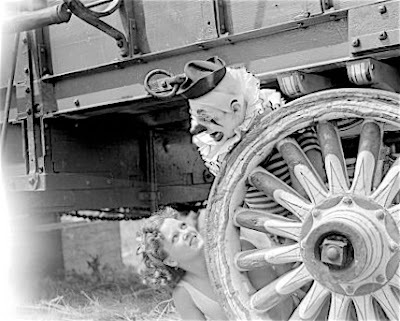 3) LOU JACOBS LIFETIME ACHEIVEMENT AWARD: Awarded for a lifetime's work dedicated to the advancement of American circus clowning. 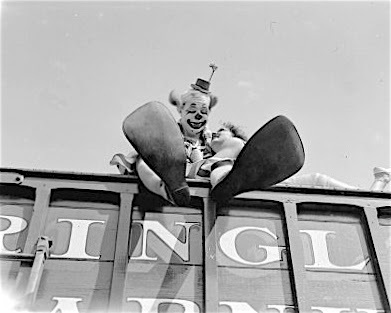 Nominees for the Griebling and Jung awards must have appeared in an American CIRCUS, or a CIRCUS that worked within the 50 United States or their territories, in the year 2006. 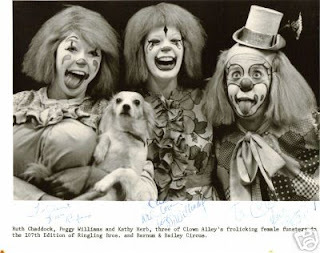 Nominees for the Jacobs award must have careers in circus clowning and/or teaching that span a minimum of 20 years. only one vote per email address account will be accepted. Winners will be announced here during halftime of Super Bowl XLI. Sa-so, a fixture in the Hamid-Morton Alley of the 50s, makes the cover of the program for this 1954 PBA sponsored date. Ruth Chaddock, Peggy Williams and Kathy Herb together in a photo from the 107th edition Ringling show. 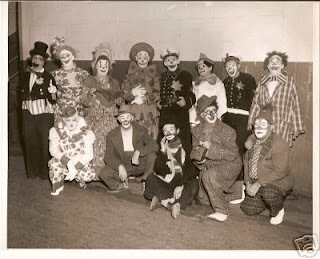 It looks like pro clowns Eddie Dullam, Jojo Lewis, Kinko Sunberry and Happy Kellams and a few others are joined here by a few locals and Shrine clowns in this photo from the 1953 Shrine Circus in Ft. Worth, TX. The Stooges appearance as meddling television executives driving Ed Wynn crazy on an episode of Wynn's early (1947-48) Emmy award winning TV show. George Carl (introduced by Jimmy Durante as "One of the World's Funniest Dancers"?!? ), performing pre-Microphone Act, on Hollywood Palace. Does anyone know the name of the piece of music Mr. Carl used as the end of his act? 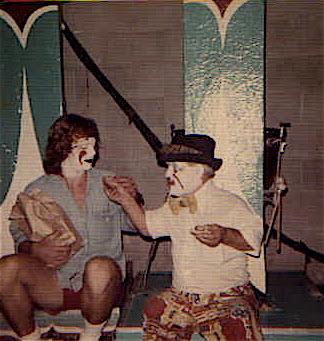 Further evidence that the picture from last week was, in fact, a very young Harry Dann, here's another photo of the same clown working with one of Harry's favorite kind of comedy partners, a trained performing duck. 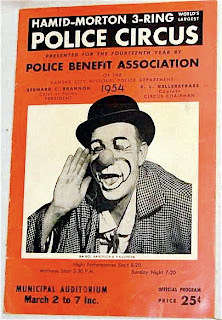 Frankie Saluto in a photo which looks to have been taken at the annual charity performances at Bellvue Hospital in NYC that Ringling used to do during their lengthy stay at Madison Square Garden each spring. When's the last time you saw a clown finish to a standing ovation at an American circus performance? 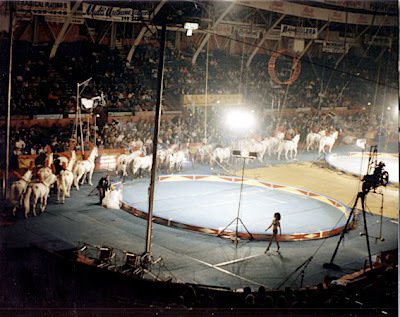 Ladies and Gentlemen, Ms. Danise Payne at the UniverSoul Big Top Circus in 1994. "I live a few miles from a portion of Los Angeles known as Culver City. Although it's presently going through a heavy influx of new businesses and structural upgrades, there are still a lot of old buildings in Culver City, which makes it a delight for us Laurel and Hardy buffs. The Hal Roach Studio was located there and though it's long gone, you can still spot a lot of the street locations where Stan and Ollie filmed. Several are strikingly identifiable from their old films even 70-80 years later. Piet Schreuders is a designer and pop culture historian. Not long ago, he did extensive research of the area, as you'll see in this clip. You'll also see a little of what he did with it, which was to create a computer model of the main streets of Culver City, regressed to the era when Laurel and Hardy filmed there. This runs a little less than five minutes and some of it is in Dutch but you'll get the idea. Thanks to Don Brockway for sharing this with us." Herb Alpert introduces European musical clowns the Sorolettis (sp?) on a mid-sixties episode of Hollywood Palace.